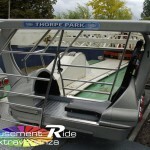 The Enterprise was arguably the most ground-breaking ride ever for it’s time, setting a standard for a whole generation of amusement rides on its debut in 1972. The Schwarzkopf Enterprise had an overall look and engineering technology that was years ahead of its time. 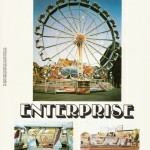 The HUSS Enterprise is in actual fact a copy from Schwarzkopf who manufactured some 20 rides. In 1976, HUSS produced their own superior copy (larger capacity, with a hydraulic arm, not electro-mechanical) HUSS has now sold over 95 Enterprises worldwide. The Enterprise consists of 20 gondolas, each fitting 2 people – one sitting behind the other. 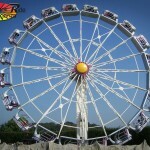 The ride then rotates clockwise gaining just enough speed to keep its riders perfectly in place with centrifugal force. The main arm then slowly lifts to 87° smoothly hurling the riders upside down. The ride may look repetitive and nauseating but the on-ride experience is MUCH different making for a very enjoyable, ultra-smooth ride. Through very clever engineering there are no safety harnesses other than the grab-bars on the car walls, due to the centrifugal force making gravity and body weight are just about equal – this creates a feeling of weightlessness while also ensuring you stay on your seat. A portable Enterprise fits on 2.5 trailers and weighs 40 tonnes, though nowadays most are park models. As a result of Enterprise’s success, HUSS produced the larger capacity Sky Lab containing fifteen four-person gondolas. Some years later, HUSS released a stand-up variation, the UFO. There are approximately 23 HUSS Enterprises in North America, at least 20 in Europe and 3 in Australia. I hope some of the ride ops here can answer this: are there any Enterprise models that let the operator vary the wheel’s speed? I saw an Enterprise (“Moon Walk”) at a town fair in Germany. When the op had it completely up, at one point he said something (?) to the riders and then it looked like he slowed it down just enough to drop the force a bit and make the gondolas sway a little as they went over the top. He really had those riders screaming. Then he speeded it up again for the rest of the ride. Thanks for clueing me in. Fun Spot America in Orlando, FL just got Six Flags over Georgia’s Schwarzkopf Enterprise ride. I believe it was called the Wheelie at SFoG, they moved it down here, renamed it the Enterprise, and installed LED lights on it. Check out my YouTube page by clicking on my name to see the video. I really like Orbiter at Canada’s Wonderland because it is the only Sky lab or Giant Enterprise made by Huss left in North America. It’s been running for approximately 32 years other than it being closed for two years (2006-2007). I like it how the gondolas have two seats instead of the single seated Enterprises. Amazing ride! Especially when it goes upside down! 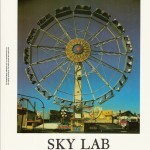 Love the HUSS Skylab @ Canada’s Wonderland, and one of the only ones left in existence in the world. It’s called orbiter. 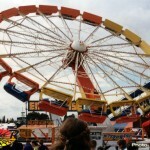 Rye Playland had one until late ’80s, and many traveling shows still run them. 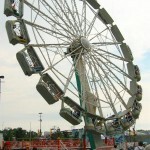 Ferris wheels on steroids, LOL! 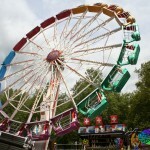 My question is: Has anyone ever ridden a Rock O Plane full cycle without EVER flipping upside-down? The yellow cages with red dot is actually called the reef diver. It is at Dreamworld Australia. I wonder what Huss will reintroduce next as they had reintroduced the Condor last year. I rode the Enterprise some years ago when I was a Carnie. I loved it! I was in awe of it. I had to ride this ride. My ex husband found someone to ride with me. The smoothest ride ever! I will never forget this ride! Ride this every year at Darian Lake. Rode it as a kid and now yy 7 year old loves it. So I get to be a young again and ride it all over again. Hope it doesn’t disappear soon, it is getting old. They had a UFO as well at the park but they removed that 2 years ago, and the Ranger was removed this year. Everyone, stay OFF the Enterprise! It is manufactured by Chance “North Korea/Nazi Germany” Rides, Inc and has a “No Single Riders” rule! Boycott Chance Rides and their cruel “No Single Riders” tyranny! 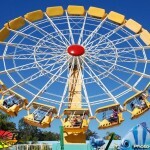 I don’t know about other rides around the world, but the one I rode at Luna Park in Australia did not have enough centrifugal force to keep me in my seat. The whole time I kept all my limbs straightened against the edges of the cart because I was holding on for dear life, especially when the person I was riding with smashed onto me from behind when the ride became almost vertical. They really need to upgrade it, or at least have safety belts, just in case the ride misfunctions. 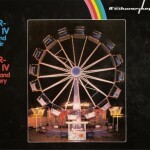 To terrified, Which Luna Park? 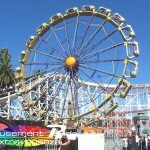 There is one in Melbourne, which I know has one of these rides, and there is Luna Park Sydney, which doesn’t.